Nourish your lips with the Antipodes Kiwi Seed Oil Lip Conditioner. Featuring the bioactive botanical ingredient kiwi seed oil, this healthy and hydrating formula helps keep the skin of your lips soft and supple. The high concentrations of Omega 3 in the oil extracted from the seeds of kiwifruit make kiwi seed oil the perfect ingredient for natural skincare, as it can dramatically help to maintain moisture in the skin. Lips can be a neglected part of a woman’s daily skincare routine. Drying environmental elements such as air-conditioning, heating and seasonal temperature changes can mean lips become dehydrated, leading to fine lines, dullness and even painful cracking. 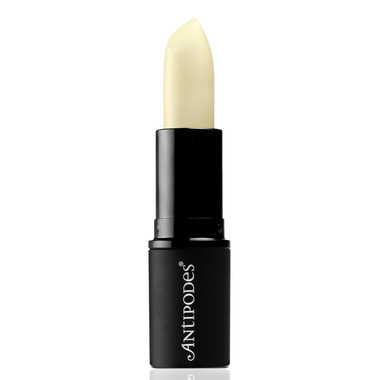 Antipodes Kiwi Seed Oil Lip Conditioner is perfect to use as a primer and conditioner under your favourite Antipodes natural lipstick. keep one handy in your handbag for an instant moisture boost at any time of day. Pricey but works very well and is worth the cost. By far the best lip treatment I have used. At first I was apprehensive about the price but decided to splurge since my lips got super chapped this winter. Traditional lip balms were not helping at all (my lips just kept getting drier); this is definitely a healing conditioner. Fixed my lips: they are smooth, soft, and healthy again. AMAZING product! This is my first time using Antipodes products and I love it. It helps my lips during cold winter weather. This is the BEST lip stuff ever. I bought it during the Well.ca Antipodes promotion and I wasn't sure it was going to be worth the price - even on sale - but I was wrong. This lip conditioner is amazing and one application lasts for hours. Will definitely buy again. Love this product! My first time using Antipodes products and this is a winner. Glides on easily and leaves your lips feeling nourished and soft. Will be trying out more products from this line! Has a very nice, smooth texture, and the scent is nice and subtle. Conditions and applies nicely. Also, the unit it comes in is great quality.